FAMOUS for not wanting to be famous, the enigmatic but eternally polite Michael Fomenko ran away from civilisation (as we call it) more than 50 years ago. Civilisation has pursued him ever since. The eccentric son of a Russian princess and former champion athlete turned teacher, Michael found peace and all the company he needed in the North Queensland jungle. In his own quiet way, he made a lot of friends, many of whom believed he was dead - until yesterday, when news broke that the man they called "Tarzan" has taken residence in Gympie's Cooinda Nursing Home. "He's happy for his friends to know he is well, but he doesn't want to speak to anyone," a Cooinda spokeswoman said. Not generally much of a talker, Fomenko was a unique Australian in an era of rigid conformity. His exclusive North Shore Sydney school reminded its community in 1999 of an athletic and very different, though fondly remembered colleague, who left it all behind in the 1960s. "Michael Fomenko has had many adventures," the Shore Reports school newsletter said, "including voyaging alone for 600 kilometres from Cooktown through the Torres Strait to Merauke in former Dutch New Guinea, navigating by the stars and surviving cyclones, attacks by crocodiles and near starvation." He was first dubbed "Tarzan" by Torres Strait island children he met on that terrifying voyage. 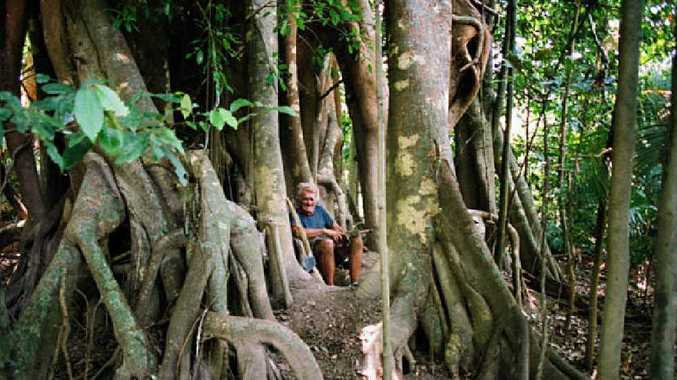 Near Babinda, he often lived in his secret tree house, fashioned among the roots of a giant fig. The Sydney Morning Herald's Frank Robson wrote about the elusive Mr Fomenko, in 2011. "He lived among Aborigines, killed crocodiles and wild boar with a machete, made dugout canoes and was lost at sea for months (on that voyage to New Guinea)," Mr Robson said. Now about 84, Fomenko became the subject of books, songs, plays, documentaries and articles. An advocate of exercise, he is believed to have been walking to Sydney when he found he could not go any further. A Gympie doctor referred him to Cooinda. Once often seen loping along the highway between Cairns and Babinda, he ran on a road less travelled and became our most reluctant legend.